“Fairy dusting” is a term used in the muscle building supplement manufacturing industry that refers to when the maker of a particular dietary supplement will says that the supplement contains “x ingredient”, but in reality the amount is so low that it isn’t efffective at all, yet, technically they’re telling the truth, the ingredient is in there, but in a very minute amount. For example, let’s say the latest bucket of protein powder you just wasted your money on says on the label that it contains “whey protein isolate” (which seems to be one the latest and greatest forms of protein hyped up in the bodybuilding magazines lately). However, that’s a more expensive form of protein than perhaps milk protein. 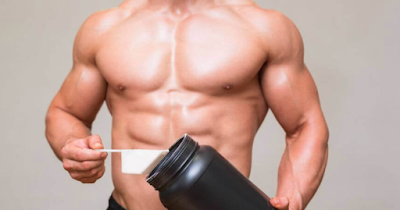 What some manufacturers may do is to go on ahead and put a very small amount of whey protein isolate in the bucket, but it’s only, let’s say, 1% of the entire bucket (although they don’t let you know that on the label!). You’re expecting to get a bucket of whey protein isolate, but you don’t realize that 99% of that bucket is in fact NOT whey protein isolate, but some other form of protein. And you overpay for that. Is the label lying? No. The bucket does in fact contain whey protein isolate, just in ridiculously small amounts. By law, labels that list the ingredients are required to place them in the order of most to least within the bucket, bottle, bar, shake, etc. For example, if there’s a supplement that contains protein, vitamin D, creatine, all in one, the label must list those ingredients in order of which is in there more to least. So, let’s say that in this particular product it is made up of 50% protein, 35% creatine, and 15% vitamin D. The order the label must list them is “protein, creatine, vitamin D” (most to least), not “creatine, vitamin D, protein”. Well, the manufacturers know this, so they realize that they must keep that ingredient listed high up on the label, and not the end or bottom, since that would raise a red flag to those that know how to interpret these labels. How do they accomplish this? By mixing a very low amount of whey protein isolate with a ton of lower quality, cheap protein, and calling it their special “proprietary protein blend”. And because this “proprietary protein blend” is what now makes up most of the bucket that’s what gets listed first on the label. Amazing, isn’t it? Why do you think the supplement industry is a multi-billion dollar industry? It sure isn’t because the products actually, that I can assure you!